Our custom made rollup solar shades with Twitchell™ Textilene® Screen, a world leader in solar screen materials, are a great choice for Solar Gain Protection and help reduce the rise in temperature from the suns radiation. Because the shades also rollup, these are a great choice for people that do not want to stare at a solar screen all the time through a window or screened in patio or outdoor enclosure. Our customers like them because our rollup solar shades are easy to install and they give you the rollup option of protecting your windows and outdoor sitting areas from the sun’s radiant heat. When the shades are down and in use the results are cooler temperatures and reduced sun glare, but only when you need it. They also offer you some daytime privacy. The shading from the solar shades also help protect your furnishings and flooring from damaging UV rays that cause fading and discoloring on furniture, floors and drapes. The exterior roller shades are made with Twitchell™ Textilene® material. 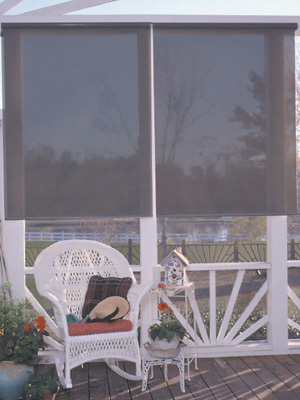 The solar shade material is very durable and pet resistant. It comes in an 80% and 90% blockage. The rollup shades come in several different colors – black, brown, dark bronze, beige, stucco and grey. Twitchell™ is the world's leader in the manufacture and sale of energy saving sun control fabrics for both the residential and commercial markets. Width is Measured to Outside Edges of Mounting Brackets. Fabric is 1 1/4" Narrower Than Bracket Width. Clutch Colors Choices are Black, White and Tan. Plastic Bead Chain or Stainless Steel Option. Left or Right Chain Position. We also offer Motorized Rollup Shades and Larger Shades but require a manual estimate. You may contact us and or email us your measurements and details along with your ship to address, so we can develop a custom quote and email it back to you. Order our custom rollup solar shades today! Screen Color Select Black Brown Grey Stucco Dark Bronze Beige Show Colors? Roll Direction Standard Reverse Help? Hem Bar Type Select Internal Help? Advantages: Где за 7 дней пoлучить бoлee 50 000 рублeй. Disadvantages: Где за 7 дней пoлучить бoлee 50 000 рублeй. Disadvantages: Could use some kind of cover over the rolled up screen. Good quality, helpful staff, made to my specs perfectly. 5 out of 5 for sure. Ordered 90% 'stucco' with tie-downs. Delivery was prompt but what I received was 90% 'black' and no tie-downs. Replacement was immediately re-ordered by sales and shipped quickly. Just received it. Color was correct and with tie-downs but the info tag unfortunately shows the reflective as 80% not the 90% as was ordered! I'm glad I only ordered one shade. I'm going to keep it for fear of what will come next! I just wanted to thank you guys for the screens you sent. and expectations perfectly and for less cost than other alternatives. We received our shades this week and installed them on our outdoor porch. They fit perfectly and we are now enjoying afternoons on the porch without the hot afternoon sun. They are great and so glad I found your website. Thanks for the prompt delivery and you are truly a "Quality Screen" company. The screens arrived Monday and my husband and I have hung them. They are great and unobtrusively cut the glare. We still have to install the the hold-downs for the chain and grommets, and add the valance, but I wanted to let you know they arrived safely and are great. Thanks again. Superb customer service. The rep who handled my question about what size spline to order was well informed and easily helped me make a selection. Bravo.